This bundle includes abreakout, hyperdoc, and choice board. Also sold separately. 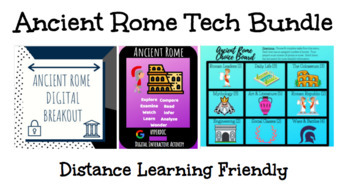 Looking for a digital breakout covering Ancient Rome? If so, then this is the document for you! All you need is connection to the internet! This breakout is on a Google site. The Ancient Romans need your help! They want to preserve their buildings, architecture, and land but invaders are threatening their empire! With your help, they can survive the attack! But hurry, time is running out! 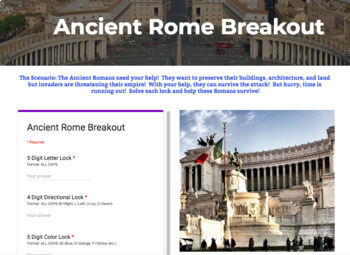 Solve each lock and help these Romans survive! You may also be interested in my Early Humans Breakout, Ancient Egypt Breakout, Ancient India Breakout, Ancient Greece Breakout, Ancient China Breakout or Mesopotamia Breakout. Are you looking for a way to make a topic more engaging, technological, and interactive? Well, then this is the product for you! 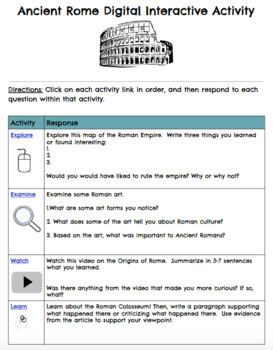 100% digital, this doc can be used to introduce or reinforce the study of Ancient Rome. Product includes the link to the doc site. Must have internet access. Doc is web-based. Video link is from YouTube. It may be blocked by school filter. If so, show the video whole class. You may need to create a Padlet, FlipGrid and Answer Garden link for a few of the activities. Some activities may require Adobe flash. Be sure your school district gives students access to documents from outside of your school district. 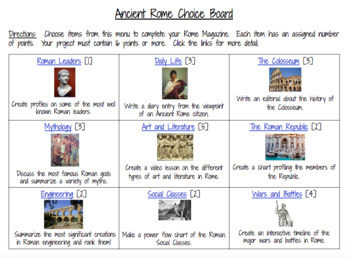 This activity includes 9 activity squares that address different multiple intelligences based on the study of Ancient Rome. This menu of activities can be used as a formative or summative assessment of Rome. It includes ranked activities by points and a variety of activities that assess different aspects of Roman culture. Activities can be modified for your group and/or unit of study. Includes grading rubric. Write a diary entry from the viewpoint of an Ancient Rome citizen. Create a video lesson on the different types of art and literature in Rome. Create an interactive timeline of the major wars and battles in Rome. Summarize the most significant creations in Roman engineering and rank them!